11plus tests Over 170 eleven plus tests can be taken online. Once a test has been completed the result will be shown immediately. Summary A quick summary of overall performance in each 11 plus subject. Retry Questions COAsT provides an easy way to retry questions that the Student previously answered incorrectly. This is the perfect way to make sure the Student doesn’t just skip over tricky question types. Detailed tag breakdown Questions are tagged eg. verbal reasoning, vocabulary, percentages etc. This enables us to give you detailed breakdown on the Student’s strengths and weaknesses thereby making 11 plus preparation more efficient. Print Tests Certain tests can be printed to allow your Student to take them offline. Enter test results manually You can also keep track of tests completed by your Student offline. 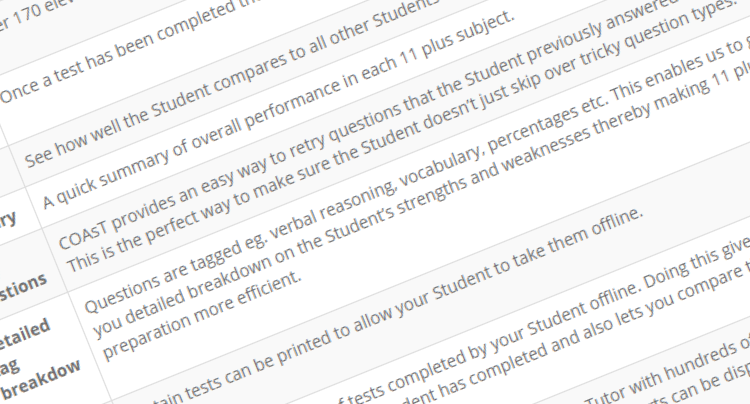 Doing this gives you a neat way to track which tests your student has completed and also lets you compare the results to other Students’ results. 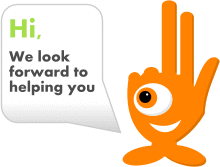 Unlimited Students Whether you are a Parent with just a few children or a Tutor with hundreds of Students, you can easily manage your 11 plus preparation through COAsT. Reports can be displayed for one Student or across multiple Students. Hi how do i use COAsT and how can i get online tests?